Two gigantic superbubbles – each one thousands of light years across – near the centre of spiral galaxy NGC 3079. 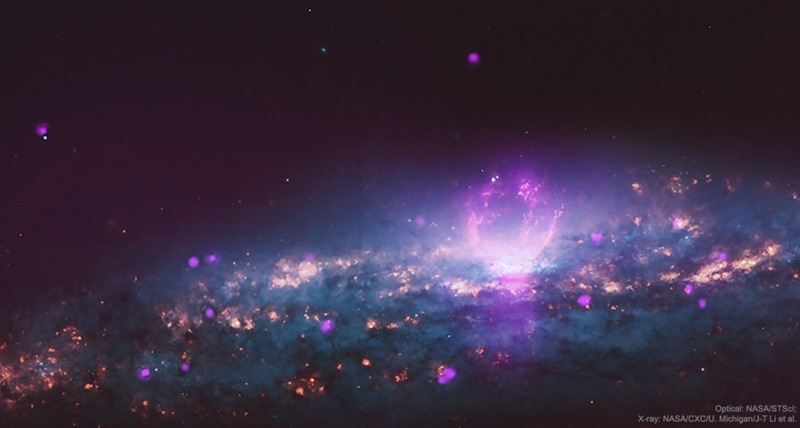 Since the bubbles straddle the center of NGC 3079, a leading hypothesis is that they were somehow created by the interaction of the central supermassive black hole with surrounding gas. Alternatively, the superbubbles might have been created primarily by the energetic winds from many young and hot stars near that galaxy’s center. The only similar known phenomenon is the gamma-ray emitting Fermi bubbles emanating from the center of our Milky Way Galaxy, discovered 10 years ago in images taken by NASA’s Fermi satellite. 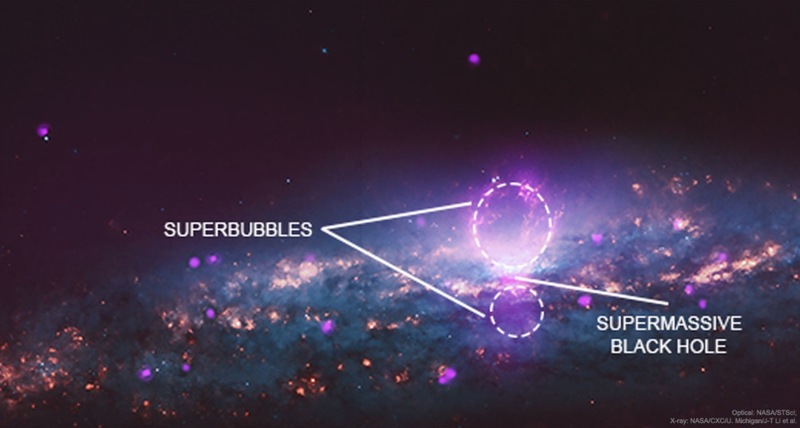 Research into the nature of the NGC 3079 superbubbles will surely continue, as well as searches for high-energy superbubbles in other galaxies. Posted in Science and tagged black hole, X-rays at 9:59 am on March 7, 2019 by Chompsky. Milky Way, Galaxy, bubbles (Aero) nom nom as you say. Also, if you want to witness a super massive black hole first hand check out Ballymena. Only jokin – watching too much Derry Girls recently.